Bantam Chickens are most suitable for small backyards where space is premium. You can easily fit two bantams into the space required by one standard bird and since they like to fly, building up will accommodate them well. They may be small but they are bursting with personality and happiness – of course, I may be biased since I do have a small flock of Barbu D’Uccles! 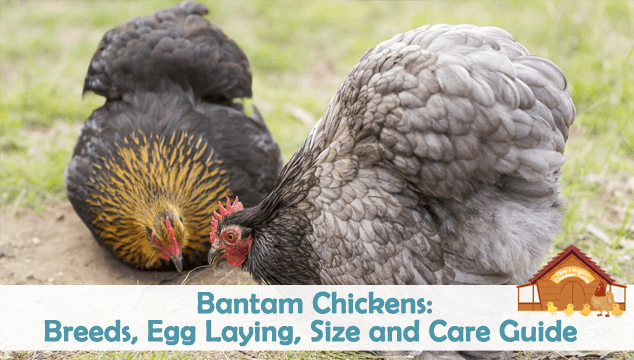 In the article below we will explain the different types of bantams, how to care for them, their egg laying ability and much more. A bantam chicken is a miniature version of a regular chicken. They can vary from one half to two thirds the size of regular birds. In total the American Bantam Association lists over 400 varieties of bantam birds. The origin of the word ‘bantam’ is from the seaport of Bantan, Indonesia. When sailors stopped into the port for fresh supplies of food and water, they were impressed by the local chickens which were smaller than the chickens back home. The word – Bantan – was corrupted into Bantam in general English and so small chickens became known as bantams. Strictly speaking there are three types of bantam chicken. There are ‘true’ bantams; these have no large fowl counterpart. They are naturally occurring with no input from mankind. 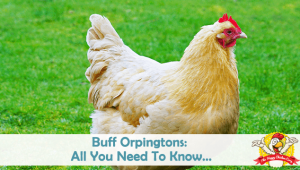 Breeds: Nankin, Sebright and Rosecomb. Miniaturized bantams – these were ‘made’ from a standard breed of choice such as Rhode Island Red, Cochin or Orpingtons. Developed bantams – these are small breeds that have been further developed with some help from mankind. They have been around for so long that the origins are sketchy at best. Such breeds are: Belgian, Pekin (Cochin) and Japanese. The developed bantam breeds can be a bit confusing really. For example the Barbu D’Uccle – it has no large fowl counterpart, so it is a true bantam. However, the breed was created around 1903 by Michael Van Gelder of Uccle, Belgium and was created by crossing two (maybe more) bantam breeds, so it is also a developed breed. 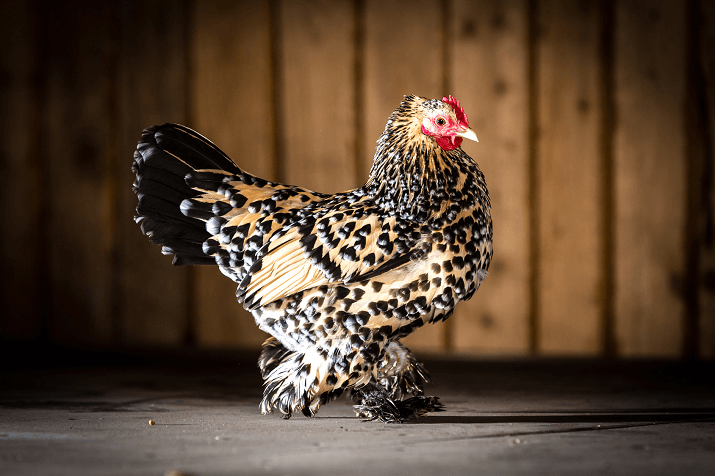 To avoid confusion among folks the difference between miniaturized and developed is usually ignored with many people saying there are two types of bantam – but now you know better! Since they are small they have a higher metabolic rate, so several of these little birds do feel the cold more than larger hens. Japanese and Dutch bantams especially are noted as not being cold tolerant. The usual requirements for housing remains; dry and draft proof. All poultry require housing that is sized for the number of birds that will be living in it. If you remember, large fowl need 4 square foot of coop space and 8 square foot of run/ per bird. Bantams require slightly less space. Several sources state 1sq.ft/bird, but 2sq.ft is preferred in the coop with 4sq.ft in the run. Bantams take a lot less room than their larger counterparts already! If you can provide lots of perches at different heights, maybe even a small tree and some bushes, they will make excellent use of them. It goes without saying that they need the appropriate food and water. Supplements would include vitamin/electrolyte powder monthly, grit and calcium, plus any suitable scraps for them. A bantam will eat roughly 1lb feed/month – you are saving on your feed bill dramatically. Bantams are usually great flyers! If you plan to keep them in a coop, make sure they have high perches and places they can fly up to if they want to. If you wish to keep them confined to that area the run will need to be covered. This will also prevent predation by hawks or owls. 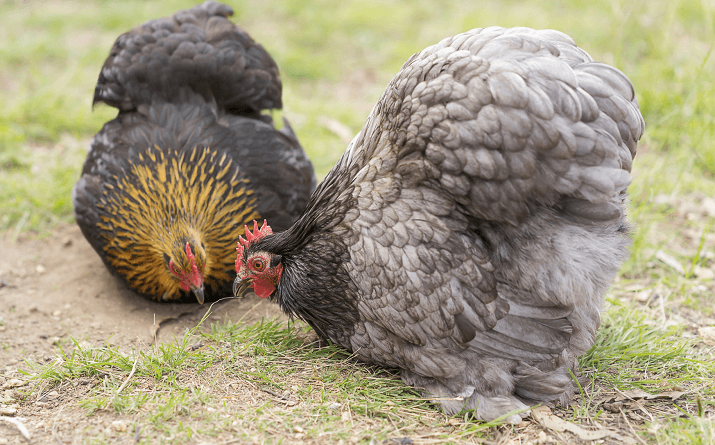 If you decide to mix your bantams in with standard breeds, make sure they aren’t getting picked on because of their size. Mine mix in with the standards and I have found them very adept at evading and maneuvering between the larger girls. They will readily fly up and out of the way if they feel threatened in any way. These diminutive little powerhouses can live up to 10-15 years, but generally their life expectancy is around 5-7 years. 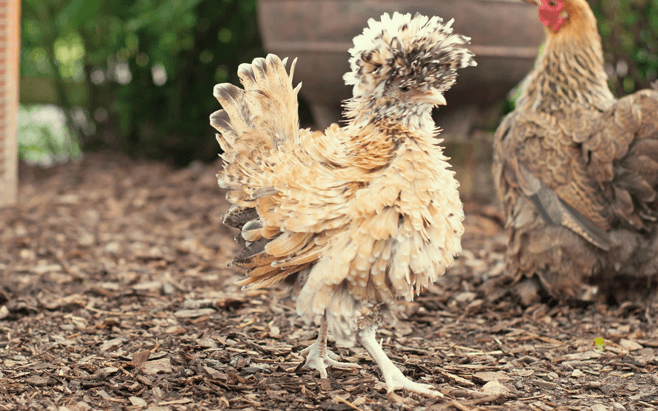 Several varieties of bantam are feather legged or ‘sablepoots’. These types of bird require their pens to be relatively mud/muck free, otherwise the foot feathers get incredibly crusted and dirty. Amending the base of the run can be fairly straight forward. If it is prone to muddiness, add some pebbles or construction sand to the area. When the area is dry enough try seeding with grass, plant a couple of shrubs if you have the space too. In the early spring, I usually add two or three large buckets of mulch to the area around the doors etc. This stuff will break down nicely, provide some ‘scratch worthy’ dirt and keep feet a bit cleaner. If the feet get crusted with dirt and poop, a foot bath is in order. Standing the bird in warm water and gently working at the feathers can be relaxing for the bird and you. Remember, these are small birds so it shouldn’t become a wrestling match as it does sometimes with the standard birds! The foot feathers can also get broken fairly easily and cause a good deal of bleeding. The good news is that with some baking powder or styptic and some firm pressure on the area the bleeding will stop. Feather footed birds are also prone to scaly leg mites. These nasty little pests can set up shop quickly and remain unnoticed for some time because of the feathering. I check my birds nightly when they go to roost but checking them once a month should suffice. Bantam eggs are of course, smaller than standard eggs; roughly half the size of standard eggs. The ratio for using them in cooking is 3 bantam eggs for every 2 standard eggs. Bantams tend to get a bad rap for laying. Admittedly it was about eight months before mine started to lay, but they have been pretty consistent since then. This past winter we have certainly had more bantam eggs than standard – thankfully! Bantams of standard fowl tend to lay slightly larger eggs and are more prolific than the true bantams. 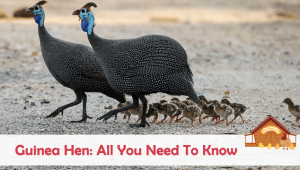 Some go broody others not, but the broodies defend their eggs and chicks fiercely and they make great mothers – not even standard hens will mess with a bantam broody! Many folks keep one or two bantam broodies to hatch out their standard eggs because they are so reliable.Obviously a bantam cannot cover as many eggs, but that doesn’t mean they won’t try! They generally have a sweet temperament and are friendly to humans and chickens alike. Roosters can be sweet, but some can also be a bit aggressive especially during the mating season. As always, some breeds of rooster are better than others, so research your chosen breed carefully. No room for large chickens? Want something different that will make you smile? Look no further than bantams. There is a large variety to choose from, whether you want a ‘mille fleur’, speckled, barred or plain – there is a Bantam to suit your taste. They are always interesting to watch, with some varieties such as the Barbu D’Uccles you can have whole conversations with! They are joyful, curious and entertaining creatures. If I could only have one type of bird it would be bantams. You didn’t mention Silkies or Frizzles. At this time, I have two Silkie hens, a Silkie rooster and a Frizzle rooster. All are just beautiful and are integrated with my standard hens and roosters. I have too many roosters but can’t bring myself to give any away. I love them all and the hens don’t seem to mind. I have a bantam rooster who lives in my house. He is free to roam around but a night he sleeps in a BIG wrought iron cage that we bought for him. He follows me around and if he is in another room, I just call his name and he comes running. He’s my little man and just loves to cuddle. He even likes to join in when I play solitaire on my iPad. Wow that sounds cool, not doesn’t he poop all over the house?? They make washable bird diapers. I’m not sure if the op uses them, but having an indoor bird roaming doesn’t have to mean poop everywhere. how do you handle the poop? The poop from my Serama rooster on my tile floors is negligible. He sits on towels on us or the furniture. We watch his health and what he eats (he gets some yogurt as a regular treat for probiotics.) His poop is solid and in 20 minutes is dry and powdery. Much much easier than parrots and other birds commonly kept. We have a “Little Man” just like that. A Serama that loves to fly up on the couch and participate in phone games. My nephew raised banties with regular ‘egg chuckers’. The banties’ eggs had no yolks or really small ones. Is that normal? Yes smaller yolks are normal, but no yolk aren’t. Please send me an email with photos and I can help! I am setting up a small coop and plan to have 4 bantams. I’m curious what the ideal roost measurements are for bantams? My husband cut 1.25 inch wooden closet rod to size, but I wouldn’t let him install it because I heard the roosts should be flat with rounded edges. Many say a rounded 2×4 is perfect, even for bantams, but others say 1 inch for bantams. What do you suggest? Hi, I have adopted 2 rooster and 2 hen Serama Bantam’s. The boys I know are just turning 6 months old, but I don’t know about the girls. The man I got them from says they are about 5 months old…Is there a way to tell about how old they might be, they have not layed any eggs yet. Loved this article! I have roughly 50 bantams mixed in with my heritage breeds. Mostly Cubalaya’s, Dutch, Sebright, Silkies, and Cochins. The hens are very broody and my best layers, I let them hatch out the eggs of my big girls regularly. Two of our roosters refuse to be outside birds so have been relegated to house pets! We handle all chicks often so they become very friendly adults, frequently flying onto the shoulders of visitors to our property. I often say the bantams are like chips… you can’t have just one. Glad to see such an informative article to educate the public and maybe help others in their decision to welcome some bantams into their own flock! You are at the high end of the spectrum, would love to see pictures. How long do bantams stay productive, on average? I have a bantam cochin– I think she is about 3 years old. She quit laying this winter when the days got short, and has not started again. BUT, her only friend is an elderly OEG who hardly leaves the coop and hasn’t laid an egg in 3+ years. Since the cochin is pretty skittish, she tends to stick close to the old biddy and doesn’t get much exercise. Not sure if this type of thing effects egg production. (We will get her some new, fun friends this Spring.) Days are about 12 hours long now. Is there something we should be doing/feeding her to get her laying again?Thanks in advance! next week! They love left over porridge and fruit scraps and lately have taken to waiting by the back door in the morning for their ‘hot brekky! Their egg production has lessened over the last year or so, but we still get around 4-6 eggs a week. I just recently hatched 2 bantam chicks and purchased 4 more. I would love to know what types I have. I will be building them a coop of their own. 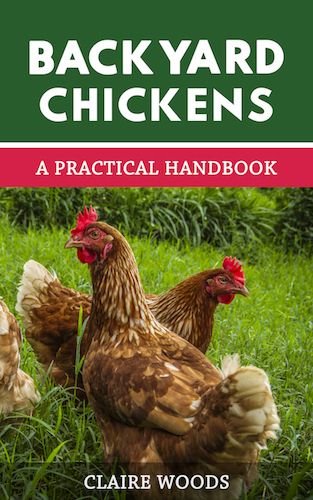 I would love some extra help planning this project so I’ll have happy, healthy chickens as the end result.